Why Bridgewater turned to Valitor for an unbeatable combination of service and price. “Since implementing Valitor’s payment solution, Bridgewater Menswear has seen significant operational savings on every transaction made in store, while customer payments have become quicker and simpler.” Conor Chappell, Owner of Bridgewater Menswear. Bridgewater is a local UK business that thrives on customer service and excellent in-store experience. How they take payments is no different. 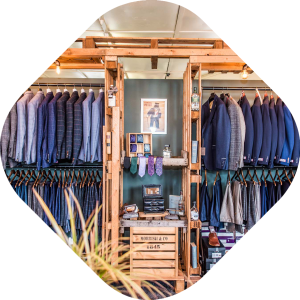 As a bespoke supplier of suits for special occasions such as weddings, Bridgewater has to ensure that every part of the customer journey is easy and pleasurable. Bridgewater owner Conor Chappell has worked in the wedding industry for several years but had always been frustrated by the complexity and high price for payments services. Since implementing Valitor, Bridgewater Menswear has seen significant operational savings on every transaction made in store, as well as ensuring that all payments are taken simply and quickly. Conor is looking to potentially open another shop in the near future and is looking to Valitor to help him scale his business by taking payments in multiple locations.